Laser rangefinders are often based on the phase shift method, a technique for measuring distances in the following way. A laser beam with sinusoidally modulated optical power is sent to a target. Some reflected light (from diffuse or specular reflections) is monitored, and the phase of the power modulation is compared with that of the sent light. The phase shift obtained is 2π times the time of flight times the modulation frequency. This shows that higher modulation frequencies can result in a higher spatial resolution. Although the phase shift is directly proportional to the time of flight, the term time-of-flight method should be reserved to case where one really measures a delay time more directly. As for an optical interferometer, the phase shift method involves an ambiguity regarding the measured distance, because with increasing distance the phase will vary periodically. However, the periodicity is much larger than in an interferometer, since the modulation frequency is much lower than the optical frequency. Also, the ambiguity can easily be removed, e.g. by coming measurement results with different modulation frequencies. Compared with interferometers, devices based on the phase shift technique are less accurate, but they allow unambiguous measurements over larger distances. Also, they are suitable for targets with diffuse reflection from a rough surface. The power modulation may be obtained with an electro-optic modulator, acting on a continuous-wave laser beam. Modulation frequencies of many megahertz or even multiple gigahertz are easily obtained. A resonant type of modulator can be operated with relatively low input voltage, but only with a small range of modulation frequencies, making the removal of the mentioned ambiguity more difficult. Some kinds of lasers, particularly laser diodes, can be modulated directly via the drive current at frequencies in the megahertz domain or even higher. 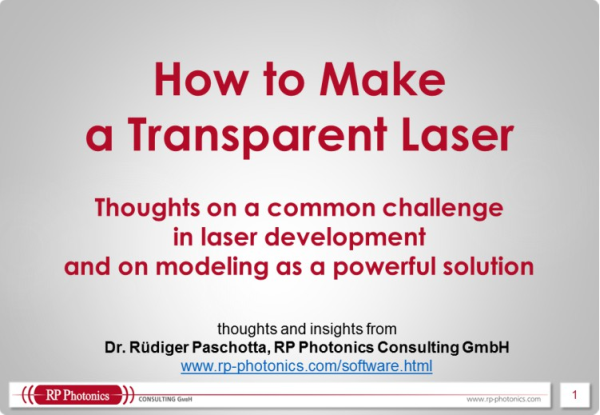 A special kind of power modulation is achieved by using a mode-locked laser. Advantages are the high modulation frequency (allowing for high accuracy) and (for passive mode locking) that no optical modulator is required. The use of a laser beam allows to realize a laser radar, where an image is formed by scanning the laser beam direction in two dimensions. However, imaging systems can also be made with one or several current-modulated light-emitting diodes (LEDs) illuminating the whole object area. The spatial resolution is then obtained via imaging detection. There are optoelectronic chips with two-dimensional sensor arrays, being able to measure the phase shift for each pixel. Find suppliers for many hundreds of photonics products. Enjoy high-quality product information (checked listings) and the convenient user interface. Use high-quality technical information of the encyclopedia nearby. 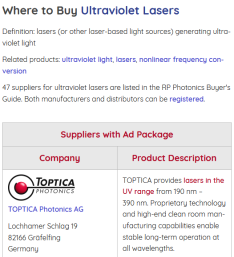 Is it actually surprising that you find the best buyer's guide at the same place as the best photonics information source?